Many businesses have dedicated procurement departments. They communicate regularly with suppliers to ensure that quality products are obtained at the best possible prices. Most farmers do not have the benefit of this type of infrastructure. We have to do the job ourselves. This requires knowledge, information and time – things we do not always have at our fingertips. So we just do the same as the previous season. Being blissfully unaware that there may be a better deal out there, we trust that the representatives and companies we are dealing with, are acting in our best interests. Because of the seasonal nature of crop farming, we generally only communicate with our suppliers once or twice a year. This does not lend itself to building firm relationships. We are also, more often than not, isolated. Our farms sometimes are too small to attract interest from competitive companies further afield. So, once again we remain loyal to existing suppliers in the hope that we are getting the best deal. Whilst being careful not to generalise and accuse suppliers or contractors of taking advantage of farmers, we have to admit that this situation lends itself to exploitation – especially to emerging and developing farmers. Any company has the right to obtain the best prices for their products, in order to maximise its revenue. Our suppliers are no different – nor are we! Unfortunately, farmers have no say in the selling price of their own products (crops) – the best we can do, is to ensure that we obtain our inputs and other services at the best possible prices. The only way to do this is by communication – by obtaining information and then comparing products, services and prices. In doing so, always be careful not to look at price in isolation. Always consider and compare the quality of the product or relevance of service in question. A “good” price for an inferior product always ends up being very costly! So how do we go about finding the right price? Here is some basic “food for thought”. Don’t restrict your conversation topics to family, politics or weather. Talk about suppliers – costs, service relationships, special deals. Share your own experiences – so that your fellow farmer also benefits. How else will you ever know whether you are being treated differently to the other farmers in your area? Believe it or not – it happens! Did you know that there are usually discounts available to farmers? Most national suppliers use incentives and special deals to attract new business – or to keep existing business. You can’t ask for something you don’t know about. If you don’t talk to your fellow farmers you’ll never know! So communicate with each other. Crop farmers should never consider themselves in competition with one another. We are equally challenged by climate and international market trends. Let’s join hands, share information and produce good food – and hopefully enjoy some financial benefit ourselves! Actively participate in meetings. Ask questions. Encourage discussions around pricing – and other benefits offered by suppliers. Invite supplier representatives to give presentations and answer questions. Initiate conversations with fellow delegates during breaks, or after the meetings. Participate in panel discussions and feedback. Share your experiences. If this not happening in the meetings – encourage the chairman or facilitator to implement it. Communicate regularly with your existing representatives. Ask them about new products and incentives. Don’t wait for them to initiate these conversations. Don’t wait for the last minute when all representatives are busy writing orders and do not have time for discussions. Initiate meetings. Talk to them out of season – when you both have enough time to discuss crucial matters. Get to know each other and build relationships, which could potentially end up in long term partnerships – essential for any farmer. Contact other suppliers. Find out how they could assist you. Get formal quotes. Compare products, services and prices. You are not being “disloyal” to your existing supplier or supplier representative by applying good business practice. Visit the NAMPO exhibition, in Bothaville during May each year. Here you will find every worthy supplier in the country and many international companies. Use this opportunity to talk to the representatives as well as see their products – getting as much information as you can, to enable you to make informed decisions later. Introduce yourself to the manager at the local co-op – let him get to know you. Have you ever met the manager at your diesel depot? Are you aware that discounts are available for diesel? Over time, you will establish long term relationships that will be based on mutual trust. Loyalty is the result of honesty, good relationships, open communication, mutual respect and trust. Any relationship needs commitment from both sides – don’t be scared to end a bad relationship. Never be afraid to negotiate – if you don’t ask you will not receive! Reliable information is crucial to the success of any business. Without communication you will be unable to have access to good information. 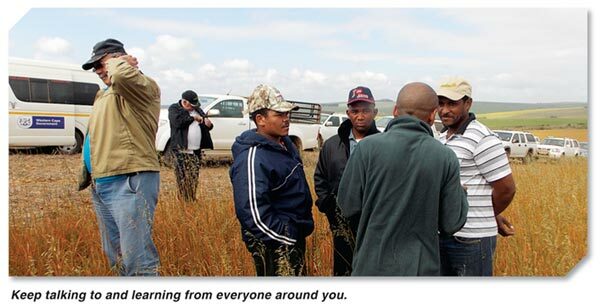 Good communication stems from good relationships – with suppliers, contractors, fellow farmers, study group members or farmer associations. Keep talking – keep listening! Give it some “thought”, and then go and produce some good “food”! Article submitted by Raymond Boardman, Farmer, Consultant and Mentor from Ventersdorp, North West Province. For more information, send an email to 3rhboardman@gmail.com.